I love cupcakes! I love eating them and I love buying items that have cupcakes on them. I am so excited that Duck Tape is coming out with tape with cupcakes on it. They need your help in designing the print of the cupcake on the Duck Tape. They are having a contest and one lucky winner is going to win $5,000. 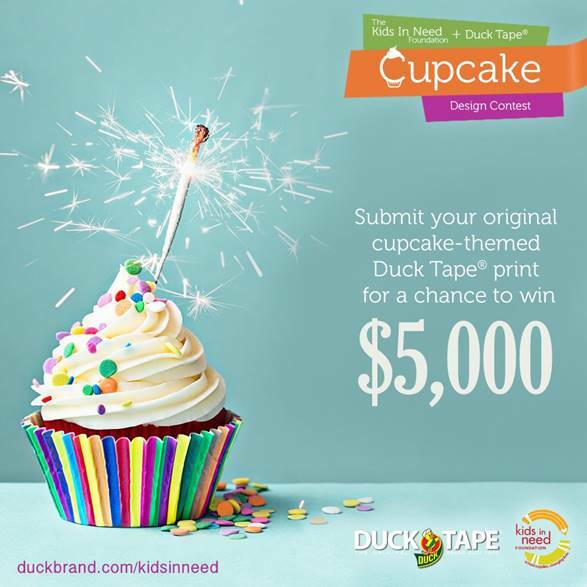 All you have to do to win is submit your original cupcake-themed design for an upcoming limited edition Duck Tape print. Duck Tape is partnering with The Kids In Need Foundation, a not for profit that provides free school supplies to kids who need them nationwide, and celebrating the 20th birthday of The Kids In Need Foundation with something sweet! They are giving one lucky crafter $5,000. This sounds like it would be fun to enter, thank you for sharing it. Can I just have the cupcake? lol!